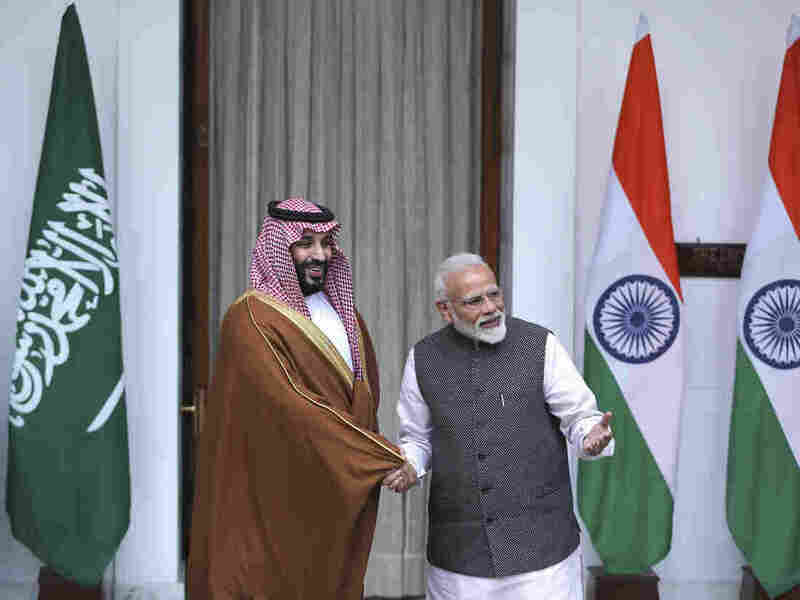 Saudi Crown Prince's Visit To India Signals Pivot Eastward For Riyadh When Mohammed bin Salman met earlier this week with Indian Prime Minister Narendra Modi, the two leaders appeared to avoid touchy subjects such as Saudi support for Pakistan. Indian Prime Minister Narendra Modi, right, shakes hands with Saudi Crown Prince Mohammed bin Salman before the start of their meeting in New Delhi, on Wednesday. One of the most powerful men in the Muslim world, Mohammed bin Salman, 33, was on his maiden diplomatic trip to India. But it comes amid heightened tensions with one of India's Muslim neighbors, Pakistan. A Pakistan-based militant group claimed responsibility for a suicide car bomb that killed some 40 Indian troops last week in Kashmir, a Himalayan territory split into Indian and Pakistani zones of control. The bomber himself was a local Kashmiri, and Islamabad denies any involvement. But Modi has threatened to retaliate militarily, and the two countries have recalled envoys from one another's capitals. Enter, MBS – as the crown prince is also known. His visit to India highlights the Saudi kingdom's pivot eastward, seeking increased economic and diplomatic ties with Asia after rebukes in the West over Saudi warfare in Yemen and the killing of Saudi journalist and Washington Post columnist Jamal Khashoggi. But his comments in New Delhi disappointed many Indians who hoped Mohammed might scold Pakistan for its role in the Kashmir violence. At a news conference Wednesday with Modi, Mohammed said he "shares India's concern on terrorism" but did not mention Pakistan – where he just was, a day earlier. In Islamabad, he pledged $20 billion in much-needed investment. Later, a statement issued by India's Ministry of External Affairs said the two leaders discussed "the menace of extremism and terrorism," vowed to "dismantle terrorism infrastructures" and share intelligence to that end. There was speculation that the Saudi heir might carry a diplomatic message from Pakistan to India. If he did, it wasn't made public. In fact, after his Pakistan visit, Mohammed's jet made a stop back in Riyadh on Tuesday before heading to New Delhi – to avoid flying directly between the two capitals. India's biggest opposition party, Congress, accused Modi of disrespecting the dead soldiers by hugging the Saudi crown prince. A former diplomat tweeted disappointment that Modi would meet at all with Mohammed, whom he called "princeling with a murder taint" — a reference to intelligence assessments that the Saudi leader was behind the killing of Khashoggi. There were street protests in Kashmir against the Saudi visit. But many others praised Modi for greeting the Saudi crown prince so warmly. "Would have been foolish to snub the leader of a strategically important country out of pique," tweeted Sadanand Dhume, a scholar at the American Enterprise Institute in Washington D.C. "Good to see national interest prevail." While the Saudi crown prince may be best known in the West for alleged links to Khashoggi's killing, his country is famous in India for something else: It's a home away from home for nearly 3 million Indian workers. Many of them are migrant workers who labor in the oil-rich kingdom and send remittances back to India. Unsurprisingly, Saudi Arabia is also India's biggest supplier of crude oil. Modi and the crown prince announced Wednesday that they had signed agreements on infrastructure, housing, tourism, and an exchange of audio-visual programs. The Indian statement said this new batch of Saudi investments was "potentially worth in excess of $100 billion." Saudi Arabia also agreed to release some 850 Indian prisoners from Saudi jails, and the two countries agreed to hold their first-ever joint naval exercises. "Ties have improved economically, politically and in counter-terrorism cooperation," says Alyssa Ayres, senior fellow for India, Pakistan, and South Asia at the Council on Foreign Relations in Washington, D.C. "But that still isn't enough to get India what it really seeks: Namely, calling out Pakistan for harboring designated terrorists in spite of its U.N. commitments." Jaish-e-Mohammed, the militant group that claimed responsibility for last week's suicide bombing in Kashmir, is outlawed in both countries. But India accuses Pakistan of harboring its leaders. France's ambassador to India says his country will put forth a proposal at the United Nations to designate the group's top leader, Masood Azhar, a global terrorist subject to sanctions. Ahead of the Saudi crown prince's arrival, a Muslim students association in India said it opposed his visit, calling him a sponsor of terrorism. Another Indian Muslim group also held a demonstration last weekend in the capital. Indian defense researchers say Saudi Arabia plays a role in the radicalization of Muslim youth in places such as Pakistan and India, by funding the construction of mosques that adhere to the kingdom's strict, conservative strain of Islam, called Wahhabism. In 2009, Wikileaks published a U.S. State Department cable that alleges Saudi-based charities "send money overseas and, at times, fund extremism overseas." Data show the number of homegrown militants in Indian-controlled Kashmir is growing, and may be at its highest level in a decade. But the causes of radicalization vary. Battling a decades-long separatist insurgency, India has deployed tens of thousands of troops in its portion of Kashmir. Their very presence makes many Kashmiris angry. Modi may have intentionally taken a transactional approach in his talks with the crown prince, sticking to economic deals and staying away from touchy topics like Khashoggi, Saudi construction of mosques, or India's close ties with the Saudi kingdom's archrival Iran, says Uday Bhaskar, a retired Indian navy commodore who directs the Society for Policy Studies, in New Delhi. "We have to engage with Saudi, and there are a number of areas where we need them, more than they need us," Bhaskar says. "Most countries walk on eggshells when they talk to Saudi leaders." India may be no exception.